The fabulous goaltending of Finnish international goaltender PETRI VEHANEN proved to be the difference as AK BARS KAZAN shutout HC MVD BALASHIKHA 2-0 in the seventh and deciding game of the KHL finals from the suburbs of Moscow to capture the GARGARIN CUP. NIKITA ALEXEYEV, a former # 1 pick (2000, # 8 overall) of the Tampa Bay Lightning, and Finnish Olympic forward NIKO KAPANEN scored the second period goals for Ak Bars that Vehanen made stand up for Kazan head coach ZINETULA BILYALETDINOV, the long-time international defenseman for the old Soviet Union. Alexeyev, the 6’5″ 227 lb forward who skated 156 NHL games (20 go 17 as, 37 pts, 28 pim) for Tampa Bay and the Chicago Black Hawks over parts of three seasons before signing for Ak Bars in the summer of 2007, scored his second goal in as many games for Kazan with 1:18 of the second period of Game Seven played in Balashikha. Alexeyev, 28, totaled four in 22 playoff contests for Kazan this spring after scoring just one goal in 33 games during the regular season. Kapanen, a six-year National Hockey League veteran, added a second for Ak Bars with his third goal of the Gargarin Cup finals less than five minutes from the end of the middle frame. Kapanen, who has now collected both a silver and bronze medal at the Winter Games with Finland, finished sixth on Ak Bars with 27 points (12 goals) during the regular season but led Kazan in playoff scoring with both eight goals and 17 points in 22 Gargarin Cup games. Vehanen, the 32-year-old mid-season acquisition from Finnish club Lukko Rauma, proved to be a decisive factor with 30 saves in goal for Ak Bars; Kazan were nearly doubled up in the shots-on-goal department by HC MVD Balashikha in Game Seven at 30-17. 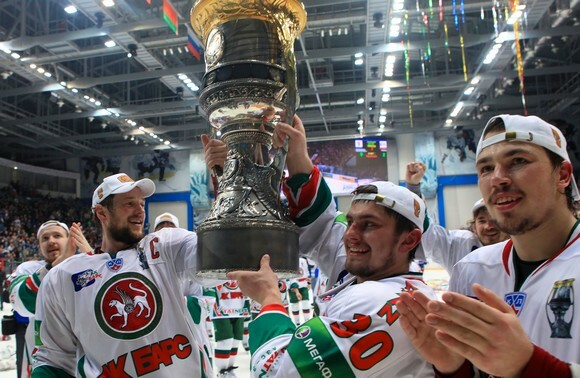 A second consecutive Kontinental Hockey League championship then for Ak Bars Kazan, still the only team to lift the two-year old Gargarin Cup. Ak Bars Kazan also won the old Russian Super League twice, in 1998 and 2007. In the days of the old Soviet Union, the Ak Bars club, then known as SC Uritskogo Kazan, competed strictly in the USSR second division and never earned promotion to the elite league. Russian Olympic rearguard ILYA NIKULIN took full advantage of his club’s only power play opportunity of the contest as AK BARS KAZAN finally closed out the season for SALAVAT YUALYEV UFA in Game Six of the Kontinental Hockey League’s Conference Final at the Tatneft Arena in Kazan. The 28-year-old Nikulin, who was taken in the second round (# 31 overall) by the Atlanta Thrashers in the 2000 draft but has never played in the National Hockey League, scored his fourth playoff goal with only five seconds left on the power play and just 4:53 remaining in the match to snap a 1-1 tie. Russian ALEXEI MOROZOV and Finland’s NIKO KAPANEN, who both represented their homeland at the 2010 Winter Olympic Games in Vancouver, as well, assisted on Nikulin’s goal and are joint leaders for Ak Bars Kazan this post-season with five goals and eleven points from fifteen games. Unfortunate was Ufa’s veteran Russian international and Stanley Cup-winning defenseman, OLEG TVERDOVSKY, who had drawn a hooking call for Salavat Yulayev’s only penalty of the game. Ak Bar Kazan’s Finnish international PETRI VEHANEN was again strong in goal stopping 26 shots to stifle Salavat Yulayev Ufa once more in this closely-contested series. Fellow Finn JANNE PESONEN, who scored 32 goals in the American Hockey League for the Scranton/Wilkes-Barre Penquins last season, sent Ak Bars to the lead with an assist from countryman JARKKO IMMONEN and Slovkian end-of-season arrival ROMAN KUKUMBERG eleven and a half minutes into Game Six. Pesonen was appearing in his first contest for Kazan since returning from a lengthy absence due to injury before the playoffs. Russian Olympian ALEXANDER RADULOV equalized for Salavat Yulayev with less than two minutes remaining in the second period. Radulov registered his 8th goal of the KHL playoffs and still leads the Gargarin Cup with 19 points from 16 games despite Ufa’s elimination. 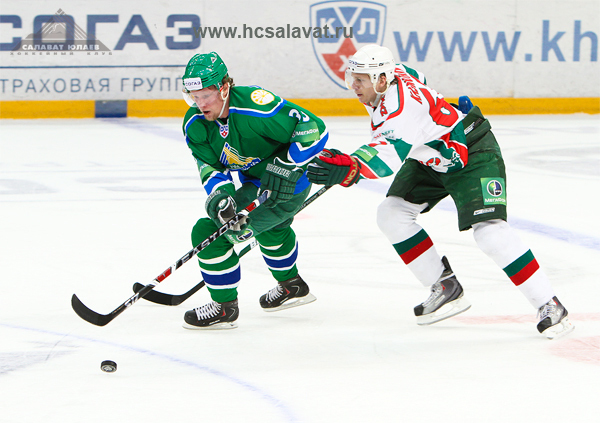 Salavat Yulayev Storming Back Against Ak Bars? After AK BARS KAZAN extended their series lead to 3-0 over SALAVAT YULAYEV UFA with a 3-2 overtime victory in Game Three of the Kontinental Hockey League’s Conference Final, it might have seemed to most that it would be just a matter of time before the 2009-2010 season obituary for coach VYACHESLAV BYKOV’s club was issued. Nashville Predators defector ALEXANDER RADULOV, however, scored two goals on the road in Game Four, including an empty-netter to seal the deal and stave off elimination. The 23-year-old Russian Olympian, who currently leads the KHL in playoff scoring, then snapped a 1-1 tie to register the game-winning-goal with just 1:16 left in Game Five Thursday at the Ufa Arena. 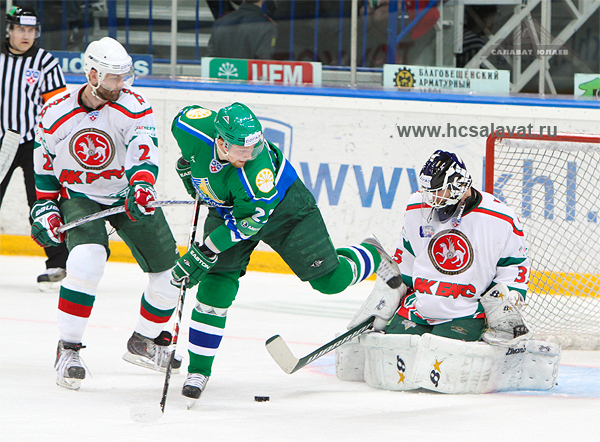 Radulov now totals seven goals and 18 points from 15 post-season contests for Salavat Yulayev Ufa. 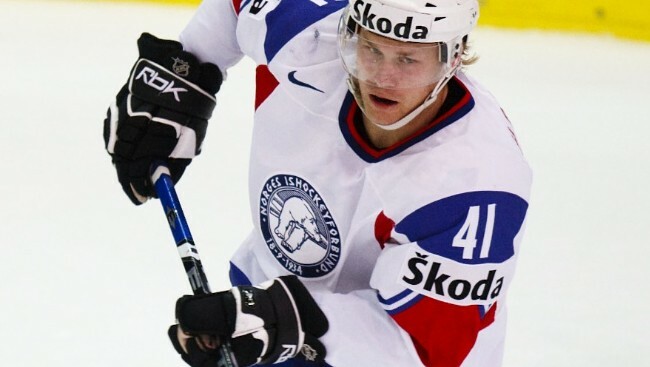 Norwegian Olympian PATRICK THORESEN, the erstwhile Edmonton Oiler and Philadelphia Flyer, assisted on both goals for Ufa in Game Five and ranks third in the KHL with five goals and 14 points this playoff season. 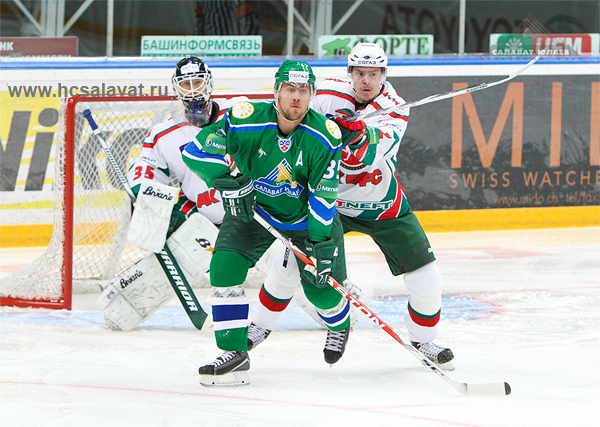 Ex-Buffalo Sabres defenseman DMITRI KALININ collected the game-winner in Game Four for Salavat Yulayev. Meanwhile, coach ZINETULA BILYALETDINOV and his Ak Bars Kazan side still need just one victory with two chances remaining in order to reach the final of the Gargarin Cup. 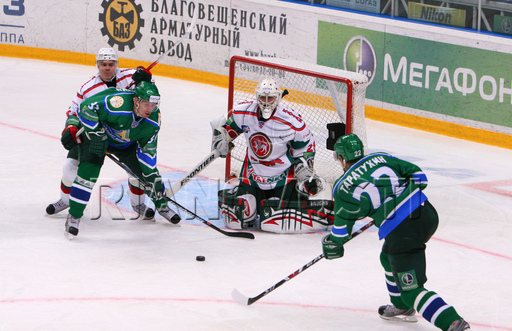 Game Six between Salavat Yulayev and Ak Bars is set for Saturday, April 10, at the Tatneft Arena in Kazan. Despite the fact that AK BARS KAZAN are the defending Kontinental Hockey League champions, coach ZINETULA BILYALETDINOV’s charges were clear underdogs heading into the Conference Final clash with fierce rival SALAVAT YULAYEV UFA. Ak Bars, after all, finished eighth overall in the overall standings of the 24-team KHL; meanwhile, Salavat Yulayev Ufa ended as the regular season champions. And, in contrast to Salavat Yulayev have 20 players who have represented their country at a major international tournament, Ak Bars currently roster half that amount. What’s more, one of Kazan’s three elite skaters to compete for Russia at the 2010 Winter Olympics in Vancouver, second-leading scorer DANIS ZARIPOV, was put out of action in Ak Bars’ opening playoff contest. Ak Bars were already without Finnish second-line forward JANNE PESONEN, a 14-goal (42 games) man for Kazan who piled up 82 points (32 goals) in 70 games a year ago for the American Hockey League’s Scranton/Wilkes-Barre Penquins. The 27-year-old wing was injured in the stretch run to the post-season. Fortunately for Bilyaletdinov, there is one Ak Bars player whose physical fitness, to speak nothing of playing form, has not suffered at all — goaltender PETRI VEHANEN. The mid-season arrival from Lukko Rauma of Finland, acquired in exchange for Swedish international and ex-NHL goaltender MIKAEL TELLQVIST, quickly established himself as one of the best goalkeepers in the entire KHL. Vehanen registered a 1.73 goals-against-average and standout save percentage of 93.5 in 25 games for Ak Bars to finish the regular season. The 32-year-old Finnish international has improved his numbers even further in the Gargarin Cup — 1.40 goals-against-average and 94.8 save percentage — playing every minute of Kazan’s eleven playoff contests. Kazan pulled off what Bilyaletdinov proclaimed to be a “massive performance” in Game One of the series Friday in Ufa. Fifty-eight seconds after Ufa’s ALEXEI MEDVEDEV completed Salavat Yulayev comeback from a 2-0 deficit in the middle of the second period, Kazan forward DMITRI KAZYONOV restored Ak Bars’ advantage with his second goal of the match (with a second assist from Finnish Olympian NIKO KAPANEN). Kazyonov, who scored 18 goals in 52 games for Ak Bars during the winter, had just one goal in nine playoff contests for Kazan coming into the Conference Final with Ufa. Five minutes into the third period, former Salavat Yulayev forward ALEXEI TERESCHENKO tallied what proved to be a pivotal goal for Ak Bars with his second strike this spring. The Russian international and one-time Dallas Stars third round pick transferred from Ufa to Kazan just this past off-season. Nashville Predators defector and KHL playoff scoring leader ALEXANDER RADULOV brought Ufa back within one at the 11:38 mark of the final frame, but the Finn Vehanen (32 saves) was able to see Kazan through to the 4-3 victory. Salavat Yulayev Ufa head coach VYACHESLAV BYKOV benched Russian international goaltender ALEXANDER YEREMENKO, who allowed four goals on 21 shots in the series opener, and inserted Kazakhstan international VITALI KOLESNIK, the one-time Colorado Avalanche netminder, for the second game of the playoff tie with Ak Bars Kazan. The Salavat Yulayev attack would unleash an even more lop-sided result for the shots-on-goal totals a second time out against Kazan as compared to Game One but, once again, found Vehanen to be operating at peak performance. Russian Olympic defenseman ILYA NIKULIN finally broke a scoreless deadlock unassisted for Ak Bars eight minutes into the second period to, once again, silence the home crowd with the opening goal. For all the pressure, Salavat Yulayev were finally, if temporarily, rewarded when ex-St. John’s Maple Leafs forward VLADIMIR ANTIPOV scored with a scant fifteen seconds left in the match. Four minutes and change into overtime, one of Ak Bars’ injury replacements gave Kazan another spectacular result. HANNES HYVONEN, the Finnish late-season acquisition from Belarussian club Dynamo Minsk, hit the back of the net to give Ak Bars a commanding 2-0 lead in the Gargarin Cup Conference Final heading to Kazan. Hyvonen, who skated 42 games (4 go 5 as, 9 pts, 22 pim) for the San Jose Sharks and Columbus Blue Jackets in the National Hockey League once upon a time, is tied for tops on Ak Bars Kazan with four goals from eleven playoff games. 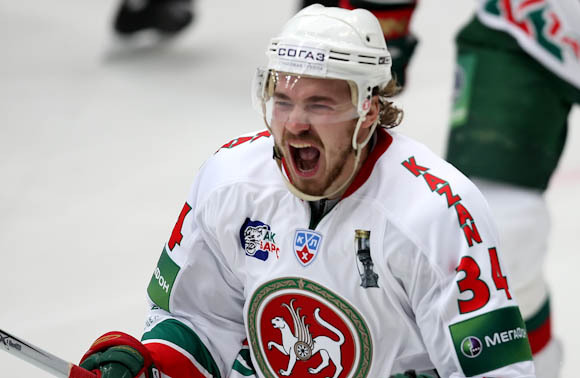 Hyvonen managed just two goals in 12 games for Ak Bars after his arrival from Dynamo Minsk, for whom the 34-year-old totaled 16 goals in 32 KHL games this season. Meanwhile, Ak Bars backstop Vehanen and his 41 saves spoke volumes with respect to whom the first star of Game Two happened to be. And, some serious soul-searching would probably be in order at this time for Salavat Yulayev. Salavat Yulayev Ufa wing ALEXANDER RADULOV (47) currently leads the Kontinental Hockey League's Gargarin Cup playoff competition with 15 points from 10 games. Radulov, who left the Nashville Predators in the summer of 2008 to sign for Salavat Yulayev with a year still remaining on his NHL contract, led Ufa and finished fourth in the 24-team KHL with 63 points (24 goals) during the regular season. No fewer than 20 of Ufa’s current playing staff have appeared at a major international tournament on behalf of their respective countries. Bykov, himself, is at present the coach of the Russian national team. Seven skaters represented Salavat Yulayev — Kalinin, Kozlov, Radulov, Zinoviev for Russia; Koltsov for Belarus; Blatak for Czech Republic; Thoresen for Norway — at the Vancouver Olympic Games staged this past February. Six Salavat Yulayev Ufa players – Kalinin, Kozlov, Ko. Koltsov, Perezhogin, Radulov, Tverdovsky — are former 1st round draft picks of National Hockey League clubs. A pair of goals from ALEXANDER PEREZHOGIN saw Salavat Yulayev Ufa safely past a pesky Neftekhimik Nizhnekamsk in the Kontinental Hockey League’s Gargarin Cup playoff action Sunday. The 2-1 result in favor of Salavat Yulayev successfully concludes the Eastern Conference semifinal series in six games for Russian national team boss VYACHESLAV BYKOV’s club. Perezhogin, a former # 1 draft choice of the Montreal Canadiens and who skated two seasons for Les Habs (135 ga, 15 go 19 as, 34 pts, 86 pim) before signing with Salavat Yulayev Ufa to start the 2007-08 season, broke a 1-1 deadlock with but 3:45 remaining in the match from Nizhnekamsk. Perezhogin scored 13 goals in 56 regular season games for Ufa this term; the 26-year-old pushed his playoff total to four goals from ten games. The Russian international is now second on Salavat Yulayev in Gargarin Cup goals behind Norway’s Olympian, PATRICK THORESEN, who has tallied five goals for Ufa thus far. 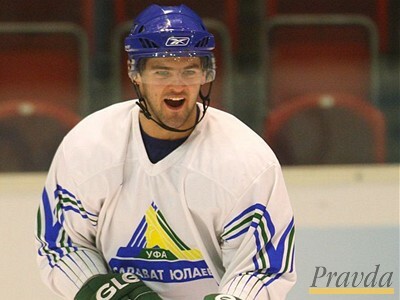 Russian Olympian and former Nashville Predator ALEXANDER RADULOV leads Salavat Yulayev, not to mention the entire KHL, in playoff scoring with 3 goals and 15 points from ten Gargarin Cup contests. Erstwhile Edmonton Oiler and Philadelphia Flyer Thoresen is tied for second in Cargarin Cup scoring with ten points. Salavat Yulayev Ufa are, of course, continue to play without injured Russian international SERGEI ZINOVIEV. The one-time Boston Bruins forward, who was very high on the KHL scoring list virtually all regular season, was injured in February at the Vancouver Games. Swedish international MIKA HANNULA, who arrived in Ufa from IF Djurgarden Stockholm only just after the New Year, assisted on both goals for Salavat Yulayev today. An Olympic gold medalist from the Turin Games, Hannula has now contributed two goals and five points to Ufa’s playoff adventure. Salavat Yulayev Ufa’s Russian international goaltender ALEXANDER YEREMENKO blocked 28 shots in today’s victory and lifted his Gargarin Cup record to 6-2 while lowering his goals-against-average to 1.35 from eight games. Bykov’s boys from Ufa, who previously put out Avtomobilist Sverdlovsk at the quarterfinal stage, advance to the Kontinental Hockey League Conference Final. Salavat Yulayev will oppose the always-strong Ak Bars Kazan club. Ak Bars, entering as the third seed in the Eastern Conference, upended number two seed Metallurg Magnitogorsk four games to two in their semifinal series. 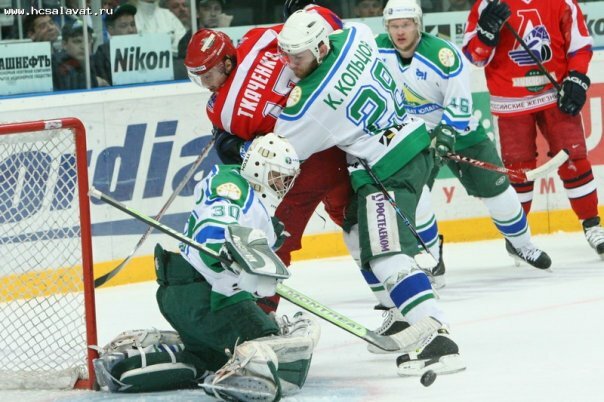 Russian international ALEXANDER PEREZHOGIN (37), the native of Kazakhstan and former first round pick of the Montreal Canadiens, finished the 2009-10 season as the fifth-leading scorer for Salavat Yulayev Ufa with 13 goals, 31 points from 56 games in the Kontinental Hockey League. SALAVAT YULAYEV UFA skated to the top of the Kontinental Hockey League table with an end of season surge and finished first overall in the 24-team circuit heading into the GARGARIN CUP Playoffs. Salavat Yulayev Ufa, who are steered by Russian national team coach VYACHESLAV BYKOV, ended the KHL season with twelve victories (eleven of those coming in regulation play) on the trot. Certainly, the quarterfinal collapse by Russia against Canada at the Vancouver Games could have just as easily generated adverse side effects for a Salavat squad that supplied four players, plus the coach and his assistant, to the failed Russian Olympic expedition. After all, results from the Vancouver Olympics were so disappointing to the nation of Russia that even the country’s President, DMITRI MEDVEDEV, publically addressed the need for improvement with harsh commentary. In Russia, ice hockey would be the definition of a high profile winter sport. An Olympic hangover never materialized in Ufa, however — if anything, a new sense of urgency has apparently manifested itself. Salavat Yulayev Ufa did make two signification transactions to strenghten its squad heading down the stretch. Swedish international MIKA HANNULA, an Olympic champion at the 2006 Turin Games, was signed from Elitserien club IF Djurgarden Stockholm in the second week of January. The 30-year-old forward had been conspicuously out of contract until hooking on with Djurgarden as a short-term replacement just before Christmas. Hannula is quite familiar with Russian elite league hockey having spent the past three seasons with Torpedo Yaroslavl, SKA St. Petersburg and CSKA Moscow, respectively. Russian international PETR SCHASTLIVY, a veteran of 129 National Hockey League games over four seasons for the Ottawa Senators and Anaheim Ducks, arrived in Ufa at the end of of January. The 30-year-old forward was acquired from CSKA Moscow in exchange for 23-year-old forward ILYA ZUBOV and a second round draft pick. Zubov has been on loan from the NHL’s Ottawa Senators after the youngster balked at another demotion to the Binghamton Senators of the American Hockey League after training camp this past fall. Hannula had an impact as indicated by some impressive numbers — 13 games, 3 goals, 10 points — while Schastlivy contributed one goal and four points in his seven games for Salavat Yulayev Ufa. The additions took on an added importance after the injury of Salavat Yulayev Ufa’s Russian Olympic forward SERGEI ZINOVIEV at the Vancouver Games, as well. Salavat Yulayev Ufa goaltender ALEXANDER YEREMENKO (30) turns aside a shot as Belarussian Olympic forward KONSTANTIN KOLTSOV (28) corrals ILYA KRIKUNOV (17) of Torpedo Yaroslavl in Kontinental Hockey League action. Former National Hockey League ninth round draft pick SERGEI MOZYAKIN of HK Atlant Mytischy concluded the 2009-10 regular campaign as the top scorer in the Kontinental Hockey League. Mozyakin, who was tabbed by the Columbus Blue Jackets at the 2002 National Hockey League draft, nipped one-time Minnesota Wild forward MAXIM SUSHINSKY of SKA St. Petersburg by one point. Sushinsky’s teammate and long-time NHL star, 36-year-old ALEXEI YASHIN, ended in third just two points off the pace. A former teammate of Yashin’s with the New York Islanders in the NHL, Swedish forward MATTIAS WEINHANDL of Dynamo Moscow, was the top-scoring imported player in the KHL for this season. Czech Republic forward JIRI HUDLER, who raised a bit of a ruckus with his off-season move from the Detroit Red Wings to Dynamo Moscow for five million bucks, ended up just inside the KHL’s top ten. Yet another former Philadelphia Flyer, PATRICK THORESEN of Salavat Yulayev Ufa, finished in the top ten for Kontinental Hockey League scoring. The Norwegian Olympian signed to play in Russia this summer after a season in Switzerland with HC Lugano. Russian winger ALEXANDER RADULOV (47) signals one of his 19 KHL goals this season as Czech Republic defender MIROSLAV BLATAK (23) acknowledges for Salavat Yulayev Ufa. The club teammates are slated to meet as national team foes in the round-robin at the 2010 Winter Olympic Games in Vancouver. MAXIM SUSHINSKY shoots past goaltender HENRIK LUNDQVIST for Russia's third goal in the 5-0 round-robin victory over eventual champion Sweden at the 2006 Winter Olympic Games in Turin, Italy. Sushinsky, who played 30 games (7 go 4 as) for the NHL's Minnesota Wild in the 2000-01 season before returning to Avangard Omsk, has represented Russia seven times (51 ga, 17 go 18 as, 35 pts) at major internatioal events. Dynamo Moscow’s controversial summer signing, the Czech international and former Detroit Red Wing JIRI HUDLER, is just out of the top ten in eleventh place on the scoring chart with 14 goals and 33 points from 35 games. 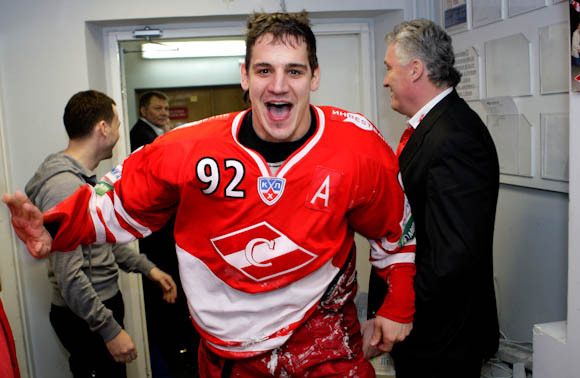 Former Philadelphia Flyer BRANKO RADIVOJEVIC, the Slovak international, is tied on twelfth for Spartak Moscow with 13 goals and 31 points from 34 games. Another Slovak international, MARCEL HOSSA of Latvian club Dynamo Riga, is the top goal scorer in the KHL with 23 goals in 35 games. Marcel, the former Montreal Canadien, New York Ranger and Phoenix Coyote player, would be, of course, the brother of Chicago Black Hawk star MARIAN HOSSA. VIKTOR TIKHONOV, meanwhile, sent out on loan to Severstal Cherepovets by the Phoenix Coyotes of the NHL recently, has grabbed four goals his first four games in the KHL, including a pair in his league debut.